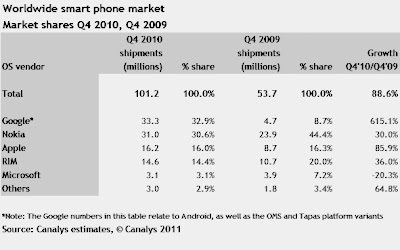 As expected, Google's Android mobile operating system has now eclipsed Nokia's Symbian OS to become the leading smartphone platform in the world. For 10 years, Symbian held the top position so this development is a clear indication that the Linux-based Android has now become the new dominant platform that may rule the industry for years to come. 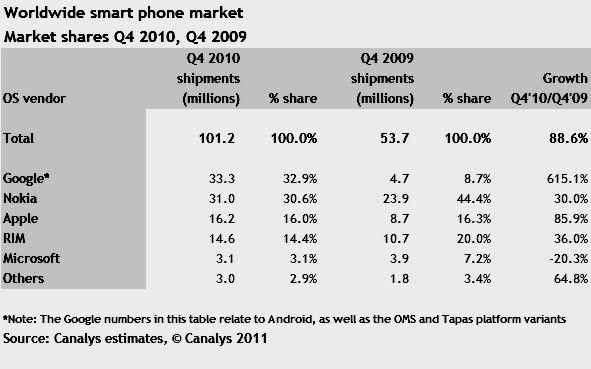 According to a report by British research firm Canalys, a total of 33.3 million mobile phones (32.9% market share) is running a Google-made platform (includes Android, OMS and Tapas) in the fourth quarter of 2010, compared to 31 million handsets (30.6% share) that runs Symbian. The amazing 615% year over year growth of Android dwarfs Nokia's 30% percent increase and is enough to cause a tectonic shift in the smartphone business. HTC Dream, the first Android-powered smartphone, was released only two years ago. Although I anticipated that Android will eventually be very successful (to the point of criticizing a well-known blogger), I never expected that it would happen this fast. It is predicted that this year, more people will access the Internet via mobile devices than through personal computers such as desktop and laptop computers. With Android leading the field, it goes to show that open platform is better than walled gardens created by companies like Apple and Microsoft. Cuz when google do it, they do it right!